Nokia Asha 500 is the entry member of the next generation Asha smartphones running the Asha Software Platform. It features a modest 2.8-inch display, 2 megapixels camera, and GPRS/EDGE Internet, but with a impressive 35 days standby battery life. Nokia Asha 500 comes with an updated version of the Asha Software Platform, which amongst other new features adds support for the the popular WhatsApp Messenger . The Nokia Asha 500 is a great low cost phone for keeping in touch. It comes ready for Facebook, Twitter, WhatsApp, and other social apps like Foursquare. The FastLane homescreen gives you fast access to all your updates and activities, making it easy to switch between apps. The latest update to the Nokia Asha Platform (version 1.1.1) offers counters to FastLane, you now see howmany new updates or messages are awaiting you in apps like Facebook and Twitter. Nokia Asha 500 comes with the Nokia Asha Browser that compresses your data traffic and saves you money on browsing. Nokia Asha 500 is now available in Nigeria. 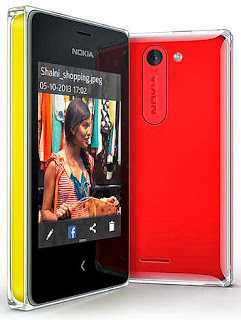 You can buy the phone at leading online stores and Nokia stores near you. Nokia Asha 500 Price in Nigeria ranges from N12,000 to N16,000 depending on your location in the country.